The Indian Navy on Friday defended its Sri Lankan counterpart saying it had never deliberately fired at Indian fishermen in the Palk Straits. Commodore PE Van Halteren, Naval Officer, in-charge (Tamil Nadu), told reporters that the Indian fishermen fell prey to the crossfire between the Lankan navy and LTTE whenever they crossed the international maritime boundary. "As a matter of policy, they do not open fire on Indian fishermen but when the fishermen venture too close to their maritime boundary, especially in the dark, it is difficult for them to distinguish fishermen from the LTTE," he said. 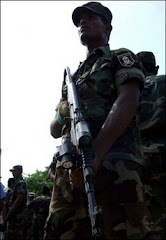 Commodore Halteren said the Lankan Navy never crossed into Indian territory to attack the fishermen who have alleged that they were frequently targeted by the Lankan Navy boats. "We are in touch with them on such issues. It would be better if our fishermen do not cross the international maritime boundary and enter their territory," he said. The Commodore's views were in contrast to the allegations of political parties in the state which accuse the Sri Lankan Navy of indiscriminately firing at the Indian fishermen, charging them with crossing into their waters. Commodore Halteren said eight Naval ships, the amphibious vessel INS Jalashwa, five missile firing units of the Khukri class among others would participate in the display of Naval vessels off Chennai on December 16. The display is being organised as part of the Navy week celebrations which will be inaugurated by Tamil Nadu governor Surjit Singh Barnala. The highlight of the event will be the blowing up of mock-up oil by the Marine Commandos (Marcos) of the Indian Navy. Ships and aircrafts of the Eastern Fleet are scheduled to participate in the display. "The display will be a source of inspiration for the younger generation," he said.